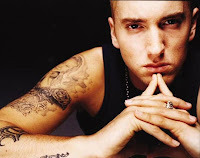 A new Eminem song titled "Rap God" has surfaced online. You can stream the six-minute track below. "Rap God" is taken from Eminem's upcoming new album The Marshall Mathers LP 2 that drops on November 5th. The track will be available to purchased at midnight (October 15th) EST via iTunes.